Only six years after selling its first car and becoming established in Scandinavia, new Swedish automaker Saab was ready to test the deep waters of a brand-new market: the United States. 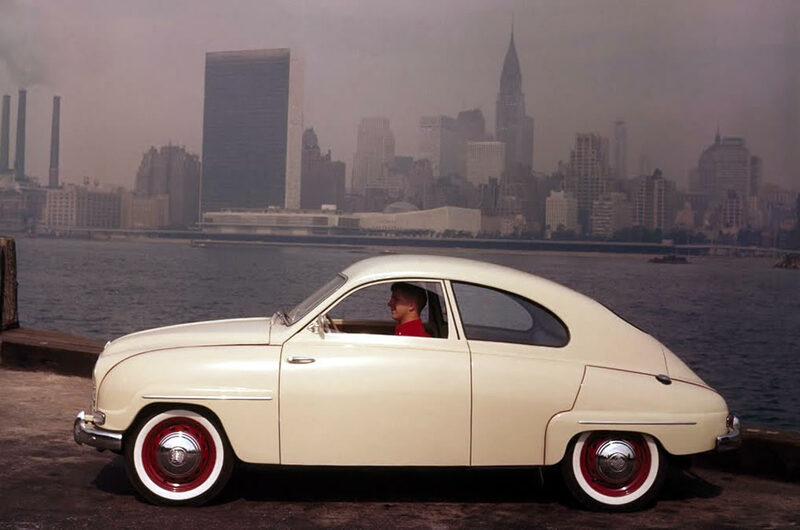 Saab made its American debut at the 1956 New York Auto show – with an admittedly small display of cars – and there was much anticipation in Sweden, as the U.S. was potentially the largest export market for the fledgling automaker. As a successful aircraft manufacturer, Saab already had an international network of parts distributors. In the U.S., Saab’s parts-buying agent was Ralph Millet, ex-pilot, aeronautical engineer and graduate of Massachusetts Institute of Technology. Millet’s company, Independent Aeronautical, was based in New York and had close communications with Svenska Aeroplan Aktiebolaget or Swedish Aircraft Company, known as Saab, based in Trollhättan, Sweden. In late 1955, Saab’s chairman, Tryggve Holm, came to the U.S. to meet with Millet about purchasing aircraft parts. Between the business discussions, Holm asked Millet his opinion of importing the new Saab 93. Millet was pessimistic about the idea and skeptical of American consumers’ acceptance of a two-stroke-powered car, as it was necessary to mix oil into the gas tank, like a motorcycle or lawn mower. And Millet confessed that, frankly, he knew nothing about the car business. But, two days later, as Millet was driving Holm to the airport, Holm insisted that he wanted to send a few cars to be shown at the next major auto show, and see how the public reacted. Without delay, five Saab cars were shipped, and Millet dutifully booked an exhibit space at the 1956 New York Auto Show. Three cars were shown: two Saab 93 models and a Sonett Super Sport. Saab’s first major model evolution of the original two-cylinder 92 was the 1956 Saab 93, equipped with a 33-hp, three-cylinder, two-stroke engine. A partially cut-away model – revealing the unusual engine, front-wheel-drive and hearty steel construction – was exhibited along with a road-ready car. The Sonett Super Sport was a limited-production roadster originally intended for competition; only six examples were built. As an original Saab “concept car,” the Sonett Super Sport was a sensation on the auto show circuit. He formed a new company, Saab Motors Inc., first as a subsidiary of Independent Aeronautical, and then taken over by the Swedish Saab parent company. Before the end of the year, Millet was president. The new company established its very modest “headquarters” at a small office on West 57 th Street, in Manhattan. The first sizable shipload of 200 Saab cars arrived several months after the New York show, and Millet focused his marketing efforts almost entirely on the Northeast. Fifteen dealerships signed up the first year, and Saab established a warehouse and vehicle preparation facility at the port of Hingham, Mass., near Boston. One of Millet’s first promotional activities was to enter three Saab 93s in the Great American Mountain Rally, during Thanksgiving weekend, 1956. With Saab’s enthusiastic support, chief engineer Rolf Mellde came from Sweden to drive one of the cars and American rally driver Bob Wehman was recruited to drive another of the entrants. Fresh snow made the grueling 1,500-mile, three-day winter race even more challenging for the 63 competitors, which included many American brands, as well as Austin-Healey, Renault, Triumph, Volkswagen, MG, Jaguar, Volvo and Mercedes-Benz. After three days of sliding around slick roads with snow up to 16 inches deep, most cars did not finish. Only one American car finished among the top 20 – and to everyone’s surprise, first place went to one of the new Saab cars. Wehman piloted a Saab 93 to victory, followed by Mellde in sixth place, while the third Saab finished seventh. Saab took the team award and finished first, third and fourth in its class. In 1957, the first full year of U.S. sales, 1,410 Saab 93s were sold, approximately 14-percent of Trollhättan’s total output. By the end of 1959, some 12,000 Saab 93s had been shipped to the U.S., making it Saab’s biggest export market. The two-stroke engine was well suited for winter operation, and owners reveled in the fact that it always seemed to start, even on very cold days. Salespeople would promote the fact that there were only seven moving parts to this simple engine: the crankshaft, three pistons and three connecting rods. But it was not without its flaws. Lubrication problems due to long stretches of consistent-speed highway driving or an incorrect fuel-oil mixture could lead to engine seizure, a catastrophic problem that required the motor to be rebuilt. Rather than ship the broken engines back to the factory in Sweden, Millet set up an engine rebuilding workship at the Connecticut warehouse facility. While Saab executives in Sweden were not enthusiastic about this America-only policy, Saab dealers were quick to promote the lifetime warranty, which covered the engine as long as the car belonged to the original owner. Who were the brave Saab buyers in the early days? A survey conducted by Saab in early 1957 revealed that doctors were the largest single group of customers, followed by sales executives and aircraft industry employees. In fourth place was a significantly large group of amateur racing drivers. Another survey, taken almost two years later, classified the largest group as highly educated members of various liberal professions, such as doctors, lawyers, engineers and college professors. Saab’s international rally heritage was the inspiration for the Granturismo 750, a special model created primarily for the American market after much persistence from Millet. Introduced at the 1958 New York Auto Show, the GT750 had additional sport-luxury features such as a wood-rim steering wheel, sport seats, driving lights, tachometer and a rally timer, plus twelve more horsepower. A station wagon, the Saab 95, was introduced in 1959, followed by the 1960 Saab 96 two-door. A new four-stroke V-4 engine replaced the three-cylinder in 1967, boosting sales significantly. Saab’s famous two-seater sports car, the Sonett II, debuted in 1966. Updated as the Sonett III in 1970, most of these fiberglass-bodied sports cars were exported to the U.S. The first Saab with an inline four-cylinder was the 99, introduced in 1968. The larger Saab 99 pioneered several Saab world innovations, such as headlight washers/wipers (1970), electrically heated seats (1971), 5-mph self-repairing bumpers (1971) and side-impact door beams (1972). Saab research into active and passive safety systems began with the first Saab prototype, and has intensified ever since. The 1974 Saab 99’s radical new “Wagonback” styling – known as “Combi Coupe” in Europe – combined the comfort and sportiness of a sedan with the load capacity of a station wagon. With a large hatchback door, bumper-height liftover and fold-down rear seat, Saab’s utility set a standard that helped maintain an almost cult-like following of loyal owners in the U.S. Although a few other carmakers had dabbled in turbocharging, or offered turbos on expensive, limited-production sports cars, Saab was the first automaker to integrate a variable-boost turbocharger into a mass-produced family-type car for extra power and low-end torque on demand. The Saab Turbo concept debuted in 1976, and saw production on the Saab 99 Turbo in 1978. A fleet of 100 pre-production Turbo test vehicles (50 in the U.S.) provided in 1971 to industry insiders and automotive journalists worldwide in 1977 received enthusiastic reviews. The era of the modern Saab began with the unique three-door and five-door hatchback versions of the Saab 900 in 1979. The 900 Turbo quickly became an enthusiast’s favorite. World innovations on the Saab 900 included a cabin air filter (1979), asbestos-free brake linings (1982), 16-valve turbo engine (1985), distributorless Saab Direct Ignition (1985) and award-winning Saab Trionic 32-bit electronic engine management (1991). Saab introduced its “large car” platform, the Saab 9000, in 1986. In a notable demonstration of Saab durability and turbo reliability, three stock Saab 9000 Turbos were driven at top speed continuously for 100,000 kilometers (62,000 miles) during “The Long Run” at Talladega Speedway, Alabama. Along the way, they set 21 world and international endurance records, averaging 131 mph over a period of 20 days. One of the first dealerships to sign on to sell the new Swedish brand in 1957 was a multi-line import specialist based in Bryn Mawr, Penn. An eager, young salesman there, Robert Sinclair, immediately developed a kinship with the new Saab 93B, with its two-stroke engine and rear-hinged doors. To garner greater exposure for the new car, Sinclair would often participate in ice racing. Sinclair’s career goal at that time was to work for a car company, but he had no interest in moving to the Detroit area where most of the American carmakers were based. In need of more dealerships, Saab assigned Sinclair to find and appoint new dealers in a wide territory east of the Mississippi, north of the Mason-Dixon line and excluding New England. Sinclair quickly moved up in the company, which had moved to a prestigious Park Avenue address in Manhattan. By 1961, Saab decided to combine its headquarters with its main warehouse facilities, and made plans to relocate to New Haven, Conn. Unfortunately, Sinclair was not willing to leave New York, and informed Millet that the company would have to move without him. Sinclair then landed a job with the other Swedish car company, Volvo, working mainly in advertising and marketing until 1978. Sinclair recalled that he was no longer satisfied with his situation there, and was ready to seek a new job. Coincidentally, Saab knocked on Sinclair’s door at just the right time, with an offer directly from Saab’s president, Sten Wennlo. It was far more than Sinclair expected: Saab wanted him to run the U.S. operations. Although Sinclair was eager for a new job, he played it cool, negotiated hard, and came away in May 1979 as president of Saab-Scania of America, with complete control over the marketing operations. During the negotiations, as Sinclair was meeting with executives of Saab-Scania AB near Stockholm, Sweden, he asked if they had one of the newly introduced 900 Turbo models nearby. Sinclair’s strategy was to move Saab upmarket in the U.S., adding luxury features and increased performance. By 1982, Saab was re-energized and saw incredible sales growth. For 60 straight months, Saab set new sales records, reaching its highest point in 1986 with 47,414 cars sold in the U.S.
After convertibles had disappeared from the American marketplace in the early ‘80s, Sinclair realized that there was a tremendous market niche waiting to be refilled. While the hatchback Saab was not quite suitable for conversion, a limited run of two-door Saab 900 coupes with conventional trunks and steel roofs eventually sparked Sinclair’s interest. The notchbacks were intended to be basic models, but product engineers tried to be flexible so that the U.S. market would accept the new car. They told Sinclair that he could take the notchbacks with any specifications he wanted, and pressured him to take 1,000 cars each year. Sinclair studied an image of the 900 notchback and, with some photographic touch-up, removed the roof. The following day, Wennlo called back and said he had discussed the idea with his engineers, who said they have no experience building convertibles and claimed the conversions were impossible. Having anticipated that response, Sinclair offered to do the engineering and pre-production work in the U.S., funded through his company’s marketing budget. Providing a ridiculously low estimate of costs just to get immediate approval, Sinclair’s plan was rolling. He commissioned American Sunroof Corp. to create a prototype soft-top Saab 900 based on the coupe. The pearl-white convertible was shown at the 1983 Frankfurt Auto Show as a “design study.” Overwhelming media response and consumer interest left Saab with no choice but to gear up for production. Initial production numbers for the new Swedish soft-tops were very conservative and still based on Sinclair’s original promise to buy 1,000 a year for three years. Other markets would take approximately 500 each year. Instead, incredible demand kept the Valmet assembly plant in Finland working at full capacity. Initial Saab 900 Convertible production was a limited run of 400 16-valve Turbo models, produced in the spring of 1986, exclusively for the U.S. market. The cars sold so quickly that most prospective buyers did not even realize that sales of the car had begun. The 1987 model was sold out long before its production had even started, and the 1989 models were already being ordered in the autumn of 1986. Total production of the first-generation Saab 900 Convertible, built until 1993, was more than 47,000. Saab’s spectacular growth and popularity in the mid-1980s resulted in a continually rising projected sales graph. Profits from the U.S. market were unprecedented, and Saab was busily planning a factory expansion and were hopeful about adding a long-desired third model to the existing 900 and 9000 lines. It all came to an abrupt halt when the stock market crashed in the fall of 1987. General Motors was shopping for a European carmaker in the late 1980s, with a desire to expand its overseas market presence. Saab knew that it needed greater resources to develop its next-generation 900. Discussions were held with a variety of international auto corporations, but it was the GM-Saab partnership that finally yielded satisfactory results to both sides. In 1990, Saab Automobile AB was formed with its new partner, GM, which had acquired 50 percent of shares in the new company. With GM as part-owner, Saab put plans for a new 900 on the fast track. After a production run of 15 years, the Saab 900 emerged as a completely new car in 1994, with stronger four-cylinder engines and Saab’s first six-cylinder, a 2.5L V-6. Available initially as a five-door hatchback, the new 900 line was joined by a high-performance three-door 900 Turbo Coupe and sleek 900 Convertible in 1995. The 900 became the 9-3 with more than 1,100 improvements in 1998. The improved handling for the new car provided the platform for what enthusiasts regard as the ultimate “hot hatch,” the 230-hp Saab 9-3 Viggen, named for the famed Saab fighter jet and the only model to carry the name of an aircraft. Saab’s factory in 1989 was taking approximately 110 hours to build each car, a rather slow process by industry standards. GM initiated principles of modern lean manufacturing that helped to shrink the build time to a far more competitive 30 hours per car with the new 900. Saab sales were up for most of the 1990s, and the 9000 was replaced by the new 9-5 in 1998, first as a sedan and soon followed by a handsome wagon. The widely acclaimed Saab 9-5 effectively underscored Saab’s commitment to the upper medium premium sector, offering a highly individual alternative to other premium competitors, with high levels of performance, safety and versatility. But it was the safety engineering, based on Saab’s real-life safety strategy, which really catapulted the 9-5 into the limelight. It featured an impressively strong central safety cage with exterior crumple zones that deformed along pre-set load paths. The 9-5 also introduced the award-winning Saab Active Head Restraint (SAHR), designed to reduce the risk of whiplash injuries during rear-end collisions. GM exercised its option to purchase the remaining half of Saab Automobile AB in January 2000, making the Swedish automaker a wholly owned division, and GM’s most recognizable global brand. Work began immediately on launching the 2003 9-3 Sport Sedan, a worthy replacement for the 9-3 hatchback. The 9-3 Sport Sedan was the first production vehicle of the most aggressive product program in Saab’s history. On the heels of two sensational concept vehicles, the 9X and 9-3X, the 9-3 Sport Sedan was the culmination of revitalized design and engineering departments who set some very ambitious goals for the new car, only the eighth all-new model in the company’s history. The current 9-3 is a modern interpretation of Saab’s Scandinavian design heritage, and it raises the bar for fun-to-drive performance and real-life safety. A new 9-3 Convertible was launched in 2004 and a five-door 9-3 SportCombi debuted in 2006, along with an all-new 250-hp turbo V-6 engine for Aero models. Saab continued its product assault with a high-performance, all-wheel-drive premium compact, the five-door 9-2X, launched in 2004. Available with a naturally aspirated or turbocharged four-cylinder engine, the 9-2X gave Saab access to a totally new segment, bringing new, younger customers to the brand. Produced in partnership with Fuji Heavy Industries, makers of Subaru vehicles, the Japan-assembled 9-2X is the first Saab built outside of Europe – but it wasn’t the last: The American-built 9-7X was introduced in 2005 as Saab’s very first SUV. Targeting the mid-luxury SUV market, one of the fastest-growing market segments in North America, the 9-7X fulfills a long-sought niche in the Saab lineup. While the Saab 9-7X has the expected dimensions and capabilities of a sport utility vehicle, its distinctive exterior and interior styling give it a much more car-like appearance than most competitors. Saab’s market research revealed that 39 percent of Saab customers in the U.S. currently have a SUV in the household. Furthermore, almost 30 percent of Saab customers who leave the Saab brand purchase a four-door SUV. “The Saab 9-7X provides our dealers with a great SUV to satisfy existing Saab customers and attract new ones,” said Steve Shannon, Saab Automobile USA general manager. In 2006, Saab stunned auto-show visitors with the Saab Aero-X concept, a bold, expressive high-performance sports coupe. Introduced at the Geneva Motor Show and also shown at the New York Auto Show, the Saab Aero-X two-seater is the most radical concept ever from Saab. Topped with a glass canopy and powered by a 400-hp turbocharged BioPower V-6, the Saab Aero-X concept showcases two core brand elements: Saab’s aviation heritage and its Scandinavian roots. Conceived as a study to explore future design directions, its innovative features preview the development of a new design language that will certainly inspire future Saab products. Each new Saab model is developed with due respect for the automaker’s rich heritage of airplanes and automobiles. With its unconventional approach to design, few car companies have produced vehicles with as much uniquely strong personality as Saab. And few companies have customers who show as much passion for their brand. For today’s and tomorrow’s models, Saab strives to remain true to the essence of its time-honored characteristics – design, performance, safety and functionality – while still expanding its presence in the marketplace. “We need to grow our product portfolio into the ‘right’ segments,” emphasizes Shannon, as he describes Saab’s strategy for the coming years. “This means maximizing our product development investment and ability to conquest market share. This also means that we preserve and distill Saab’s brand essence. To minimize the impact of currency fluctuations, we must devise manufacturing strategies that support the brand and the necessary growth – for both the short term and the long term. In addition, it’s essential that we communicate a brand identity that is uniquely Saab, through thoughtful, aggressive marketing and advertising. We must provide clear competitive differentiation. Clean, Scandinavian design, fun-to-drive performance, world-class safety and a comfortable and functional cockpit are qualities that Saab drivers expect in their vehicles. With more than 1.1 million vehicles sold, Saab has delivered on those expectations for more than half of a century in the United States – and will continue to provide customers with new products that are certain to keep the passion flying.